You may never settle for a stale, store-bought ice cream cone again once you've tasted these fragile, beautifully imprinted Norwegian cookies. If you've never baked krumkake before, check out these step-by-step instructions for using a krumkake iron. Add vanilla and ground cardamom. Stir in the flour, mixing well. Add water until batter is the consistency of a thick cream sauce. Lightly grease the two sides of a krumkake iron with cooking spray or melted butter (If using an electric krumkake baker, follow the directions provided by the manufacturer.). Heat iron over medium to medium-high burner just until a drop of water sizzles on the surface; to prevent damage to the iron and to keep the cookies from scorching, do not heat over the highest setting. Spoon a heaping tablespoon of batter onto the center of the iron. Close iron, squeezing handles together lightly to spread the batter, but not so tightly that the batter leaks down the sides of the iron. Because of the batter's butter content, leaks that hit the burner cause some interesting flame action. Keep a damp towel on hand to swiftly wipe up any leaks and to prevent baking krumkake flambé!). Bake for 30 seconds, flip iron over and bake an additional 30 seconds. Flip iron back to initial position, open, and immediately roll cookie around a krumkake cone or the handle of a wooden spoon. Slip off the cone and allow to cool on the rack. Store in tightly sealed container in order to retain crispness. 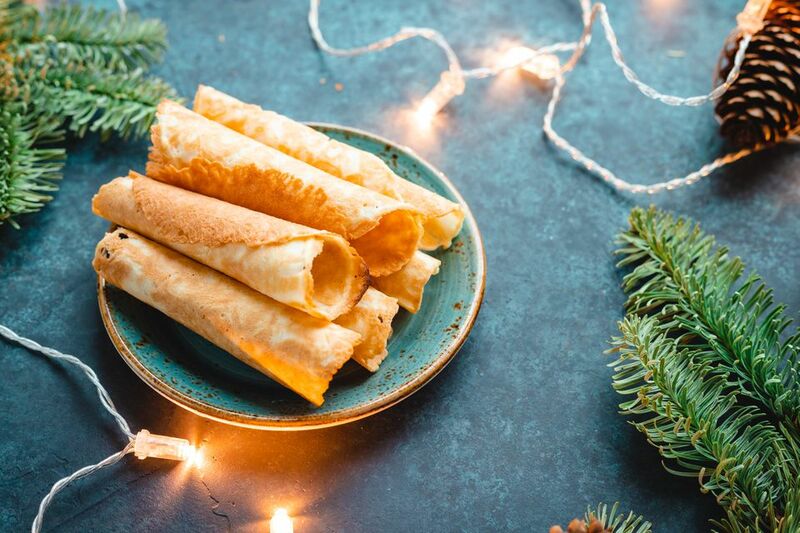 Krumkake is equally delicious when served alone or when filled with whipped cream and/or fruit.